Whether it’s in new construction, a renovation or a retrofit job, spray foam can be a great investment for your home. (NAPS)—Designing an energy-efficient home or building is no longer simply a great idea, but is becoming mandatory in some of the United States. In fact, many states now require builders to reduce energy use in homes and businesses. Twenty-five states have implemented the Energy Efficiency Resource Standards (EERS), which are approved by the U.S. Department of Energy and set long-term goals to lower energy use by utilities and consumers. Spray polyurethane foam insulation serves as not just insulation but can also seal air leaks and act as a moisture barrier. By sealing cracks, seams and joints, spray foam insulation can provide a major boost for improving energy efficiency as it is estimated that approximately 30 percent of energy lost from heating and cooling in buildings and homes is due to air leaks. Applied as a liquid, spray foam expands, able to seal leaks and improve a building’s energy envelope. This is especially relevant in states with high energy costs, like Texas, New York and California. In Texas, the average person spends $5,983 a year on energy, including a large amount for air-conditioning in the hot Southwestern summer. In 2009, New Yorkers consumed 15 percent more than the U.S. average for energy, including for heating homes during cold winters. In California, home of some of the stronger energy efficiency standards, it is estimated that heating and cooling costs account for 45 percent of the average household energy bill. Spray foam insulation is already helping cut costs there. 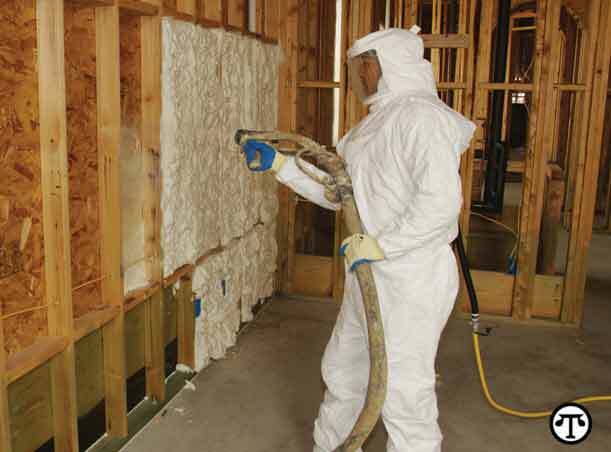 As of 2013, new homes in California using spray foam insulation are saving approximately $3.3 million each year. These successes have helped California on its way to “leading the nation in energy efficiency,” according to Gov. Jerry Brown. To learn more about the benefits of spray foam insulation, visit www.whysprayfoam.org. *Savings vary. Find out why in the seller’s fact sheet on R-values. Higher R-values mean greater insulating power.